Multi-purpose park with Campsite, BBQ, Zoo, Fishing, Sport facilities, Athletic Playground, Multi-use Playground, Beautiful Flora and Fauna. Chikozan Park in Sayama is close to the controversial proposed site of the 2020 Tokyo Olympics Golf Tournament. It is a beautiful vast park with lots of attractions for all types and ages. There are two playgrounds in the park. Both are set in a wooded area which affords plenty of shade and protection from the elements. They are beside each other too, so kids can run between both and enjoy a couple of hours of fun. The athletic playground was undergoing work for our last 3 visits since the start of the year, but according to the website it is back open for public use. Update February 2017: most of the old equipment of the athletic playground has been removed and they are currently putting in new equipment. Two of the new pieces and one of the old are currently open for use. The general playground is colourful with some unique equipment. 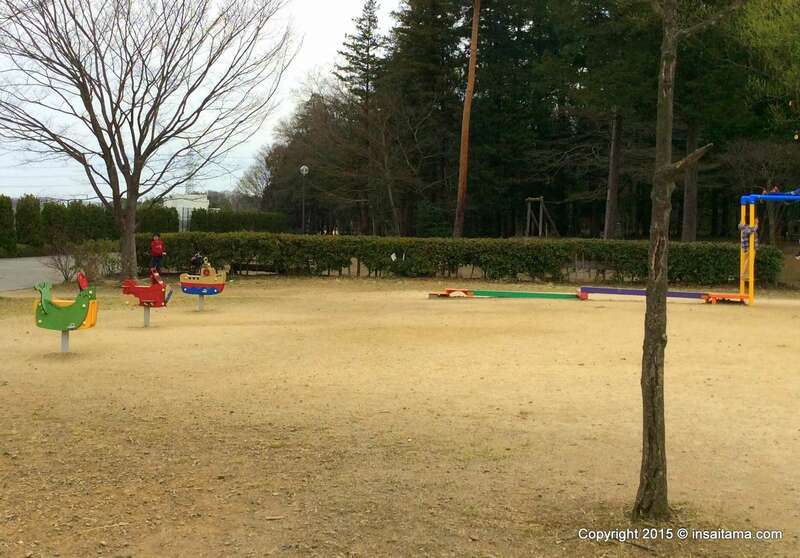 About a 15 minute walk from these playgrounds is the zoo (more information on the zoo: Chikozan Park Zoo). Past the zoo is a marsh with a boardwalk running through it leading to the BBQ area and camping grounds. The camping grounds also has 2 wooden cottages, which are very reasonable to rent. There is other accommodation in Chikozan in the Welfare Center. The welfare center takes care of the BBQ facilities and this is where you can order BBQ food sets. You can barbecue from March. Sporting facilities include a large sports hall with table tennis, training room, running course, martial arts dojo and many more. There are tennis courts near the children’s zoo. There is a club house in this area. Beside the tennis courts there is a family restaurant. It is a Japanese style restaurant with a raised tatami section which is useful with small kids. The kid’s meal is reasonably priced and quite nice too (pictured below). The park and its parking are free, but you do need to pay into the zoo (which is very reasonable) and to use some of the facilities such as the tennis courts and camping grounds. You can book online, however their website is in Japanese only. I particularly recommend Autumn and Cherry Blossom season as a prime time to visit Chikozan park. There is one garden in the park with a number of Cherry Blossoms around a lake. The zoo also has some lovely cherry blossoms pictured below. Parts of the park can be accessed at all times, but the car parks and various facilities have varying opening and closing times. Generally speaking the park is most accessible between 9 am and 4.30 pm. There are toilets in various locations in the park. For the Tokyo 2020 Olympics the area of Sayama may well be a pre-games training camp host for RUGBY. The training camp grounds are at Secom Rugby Field very near this park. Thank you 🙂 I’d like to have taken a few more choice photos, but I tend to just snap what I can when I have the kids with me. Someday…! Yeah! It’s so rare to find some tranquility in Tokyo – especially in the busy seasons when people are hustling to look at autumn foliage! 🙂 Always something to hustle for in Tokyo! Do you come out the burbs much, for a bit of peace and quiet? I love to get in to Tokyo for my dose of hustle! Haha 🙂 I don’t get out to the suburbs as much as I’d like! During the winter, we usually spend a few weekends near Nagano, but it’s been too busy for the past year so we haven’t been able to make it! I’m crossing my fingers for January! The only answer is to win the lottery 🙂 I’ve a lot to get to yet too, especially down South. But I have been to Okinawa and loved it. It was before hubby and kids so I hope to get back with them someday. Where has been your favourite place to visit to date? I have a soft spot for Shizuoka. great looking park to explore!